3/8” thick natural wood grain laminate Base, Tall and Vanity back panels; Wall cabinets have 1/8” thick natural wood grain laminate back panels. 1/2” thick natural wood grain laminate with dado joints and fasteners. 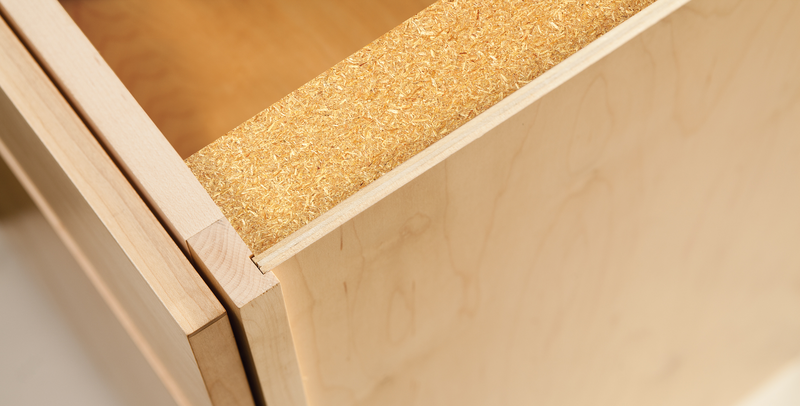 When the All Plywood Construction option is selected, the bottom panel will be plywood. 3/4" solid wood adhesive and hardened steel fastener construction. The solid hardwood front door frame is 3/4" thick. 1/2” thick with matching laminate exterior. When the Plywood Ends option is selected, end panels will be plywood with matching veneer exterior. I-beam braces provide full-depth stability and strong anchor points for countertops. Solid hardwood or laminate drawer fronts. 3/4" thick solid wood full-depth drawer with dovetail construction and 3/16" plywood bottom. Full-depth, 5/8" thick solid wood, dovetail construction. Full-extension undermount drawer suspension system features self-closing design. 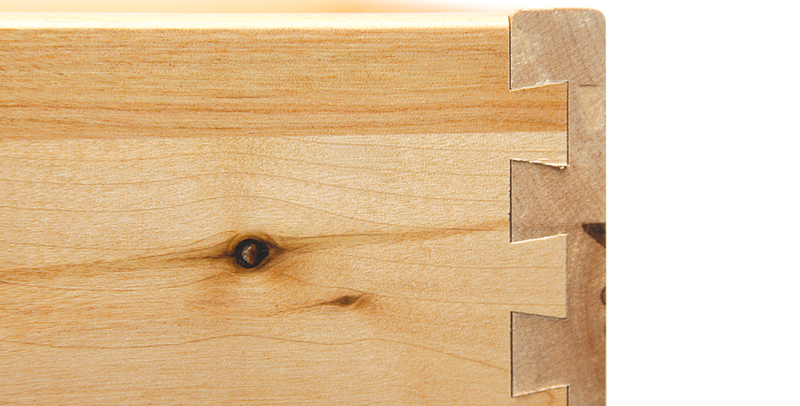 Dovetail cores are standard, and drawer guides are full extension. Fine wood finish resembles a hand-wiped stain through a durable fourteen-step furniture process. Doors are 3/4" thick engineered wood or solid hardwood. Clear pliable round shaped bumpers to dampen closure noise. Wood doors feature hardwood stiles and rails with solid wood center, or veneer center panel. Laminate doors feature an MDF core. Optional Roll-out Trays feature a 5/8” thick solid wood dovetail construction with the full extension Whisper Touch runner system. Base cabinet single roll-out tray standard, provide half depth storage and easy access. Optional standard and deep roll-out trays are available, as well as full depth shelf option. 3/4" thick natural wood grain laminate. All wall cabinet shelves are adjustable and made from 3/4" thick engineered wood. All cabinet sides, bottoms and shelves have moisture and stain-resistant easy clean interiors. The Whisper Touch™ System from Merillat Masterpiece® — Adding to our already popular soft close drawers, the Whisper Touch™ System features a new hinge that closes doors softly and quietly every time. Each hinge has a soft closing mechanism built right into the hinge and also features an on-off switch that allows you to adjust the closing speed for doors of all sizes. And maybe best of all, it’s standard on all Merillat Masterpiece cabinetry. Soft-Close hinges standard with six-way adjustable, and come with a limited lifetime warranty. Available in both full and traditional overlay doors. *Standard options listed – additional features may be available. Consult the Product Specification Guide for the full list of available options.